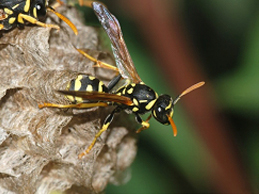 Paper wasps are flying insects often mistaken for yellow jackets. Seen as beneficial to gardeners, these insects excel at controlling the populations of insects that feed on plants. In spite of these benefits, care should be taken when near wasps and their nests, as they will sting if they feel threatened. Color: Typically black or brown with yellow markings, although color can vary by species. Size: 3/4 – 1 inch long. Food: Primarily nectar, but feed insects like caterpillars and flies to larvae. Habitat: Occupy paper-like nests built from wood fiber and plant matter. Nests are constructed in rows of exposed hexagonal cells, forming an umbrella shape. Eggs are then laid in cells. Wasps typically build nests under overhangs like eaves and door frames, as well as on plants. Wings are smoky black that fold lengthwise when at rest. As mentioned previously, paper wasp nests are umbrella shaped with exposed cells. Yellowjacket nests are typically built in concealed areas, like burrows or wall voids, although some species will build enclosed aerial nests. While paper wasps are ecologically beneficial, they can be aggressive if provoked. Venom from stings can cause allergic reactions, so it is advised that any nests in close proximity to home or in high traffic areas be removed by a licensed professional. Only females have the ability to sting. The stinger is part of an egg-laying structure called the ovipositor, which males do not have. Wasps live in caste systems that are not always identified by different physical features. Instead, behavior is often necessary to identify roles. Yellow jackets are a flying, stinging insect that are often mistaken for paper wasps because of their similar shape and coloring. Although they can be beneficial to local ecology, yellow jackets will sting if provoked, which can lead to allergic reactions. Therefore, it is important to know what to look for and to avoid contact if possible. Color: Usually black and yellow bands on abdomen. Size: 3/8 –5/6 inch long. Food: Insects, meat, and sugars. Habitat: Typically build nests underground or in concealed voids on structures. Some species will construct enclosed aerial nests made. These nests are a paper type material made from chewed up cellulose. Food: Found throughout the U.S.
• Because yellow jackets feed on meats and sugars, they are often found around trash cans, grills, drink containers, and other areas where meat or carbohydrates are found. Wear shoes at all times when outside. Keep trash cans covered and all cooking areas clean. Drink from containers that can be closed. Do not swat at yellow jackets as they will sting if provoked. 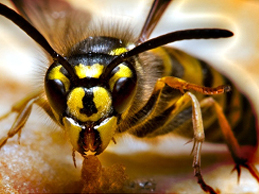 If you notice yellow jackets on or around your home, contact a licensed pest control professional. 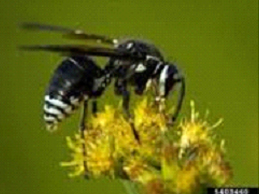 Mud daubers are wasps that build nests from mud. While most species actually build their nests, others like the metallic-blue mud dauber move into nests vacated by other species. Mud daubers build nests around paralyzed spiders and insects which are left for their young to feed on. These wasps are rarely aggressive and don’t often sting. Color: Depends on species- frequent colors are black, black and yellow, and blue. Size: About 1 inch in length. Food: Adults typically feed on nectar, but stock nests with paralyzed spiders for larvae. Habitat: Prefer sheltered areas like covered porches, under eaves, garages, barns and sheds. Region: Found throughout the world. While mud daubers are rarely aggressive, licensed pest control professionals should be contacted. More aggressive and dangerous species often move into these nests and should be treated with care. Furthermore, nests should be destroyed as they can host populations of cabinet and carpet beetles. These can be of further detriment and expense to home and property owners. Carpenter Bees are traditionally considered solitary. They generally do not nest in colonies. They get their name from their habit of boring into wood to make homes to raise their young. They are close in appearance to the bumble bee. While bumble bees and Carpenter Bees are extremely similar in size and shape Carpenter Bees can be identified by their hairless and shiny abdomen, as bumble bees’ abdomens are covered by dense hair. Males have larger eyes and may have a white or yellow face. Size: 1/2 – 1 inch long. Food: Pollen and nectar gathered from flowers. Habitat: Carpenter Bees are not social dwellers. They typically bore circular holes that are the same circumference as their bodies into wood and then begin to burrow along the grain of the wood. Region: Various species found throughout the U.S. 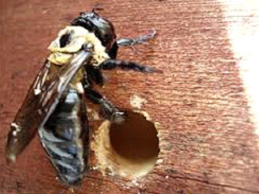 Male Carpenter Bees have no stinger while females have a straight stinger that allows for repeated use. Stingers are not barbed so a Carpenter Bee will not die from a single sting and may sting repeatedly. Tunnel openings may seem shallow but can be up to ten feet long. To prevent property damage, contact a licensed professional to handle removal. Bald-faced hornets are not true hornets and are actually a type of yellow jacket. Unlike most yellow jackets, they do not build nests underground, but instead construct enclosed, hanging nests. They are sometimes considered beneficial in reducing populations of nuisance insects, but should be removed by a licensed professional if suspected around homes. Color: Black with white pattern on face. Size: 1/2 – 5/8 inches long; queen ¾ inches long. Food: Sugary ,substances, like nectar, honeydew, and fruit juices ,Insects. Habitat: Bald-faced hornets build pear-shaped, enclosed aerial nests which are typically found on tree branches, although they can be found on buildings. These are a grayish-brown and can be up to 3 feet long with high traffic where opening is found. Nests are used for only one season. If bald-faced hornets are suspected, it is best to contact a pest control professional for identification and removal. They are more aggressive than other types of yellow jackets and will sting repeatedly if provoked. Nests should only be observed from a distance to not aggravate colony. 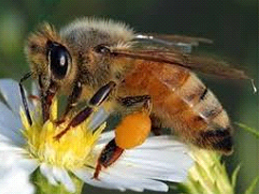 Africanized “Killer” Bees are often mistaken for common European honeybees. The only way to tell the difference is by measuring their bodies and wings as “Killer” bees are generally larger than their European counterparts. Africanized Bees are more defensive and attack relentlessly if a threat is perceived. “Killer” bee venom is no more potent than European honeybees’, but because they attack in vastly larger numbers, the danger of “Killer” bee attacks is exponentially greater. If Africanized Bees are found in or around the home, a licensed professional should handle the removal process. Color: Golden-yellow with darker brown bands. Food: Pollen and nectar is gathered from flowers to feed larvae and other colony members. Habitat: Africanized bees may have small colony sizes and may build nests in tires, boxes, or crates, as well as sheds, garages, and disused vehicles.. Region: Arizona, California, Florida, Texas, Nevada, New Mexico, and Oklahoma. Barbed stingers which are torn off when bee tries to pull away. If attacked, run in a zigzag pattern and seek shelter in a home or vehicle..
Before moving or disturbing items that may be infested, inspect items carefully for signs of infestation. When handling items that may house nests, wear long sleeves and heavy gloves. Because nests may be very large, and bees are extremely aggressive, contact a pest control service to address an infestation. 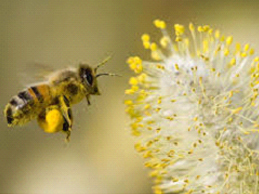 Bees of all varieties live on nectar and pollen. Without bees, pollination would be difficult and time consuming – it is estimated that one-third of the human food supply depends on insect pollination. Bees have a long, straw-like tongue called a proboscis that allows them to drink the nectar from deep within blossoms. Bees are also equipped with two wings, two antennae, and three segmented body parts (the head, the thorax, and the abdomen). Honeybees are social insects that live in colonies. The hive population consists of a single queen, a few hundred drones, and thousands of worker bees. Food: Pollen and nectar is gathered from flowers to feed larvae and other colony members..
Habitat: Honey Bees can be found from holes in trees to the walls of your home. Region: Many people believe that honey bees originated in Africa and spread to northern Europe, eastern India, China and the Americas. However, because honey bees have been domesticated to produce honey for human consumption, they are now found all over the world in different habitats. If attacked, run in a zigzag pattern and seek shelter in a home or vehicle. 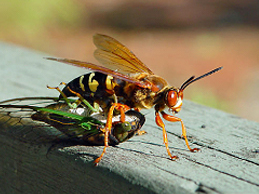 The Cicada Killer is one of our largest wasps. Color: The large abdomen (back section) is black and yellow Its head and thorax (front two body sections) are a rust color are yellowish and its wings are clear with orange-red tint. Size: Up to 1.5inches long. Food: Adult Cicada Killers eat very little, getting their energy from flower nectar. Their larvae eat cicadas. 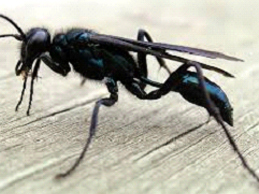 Habitat: This wasp lives at the edges of forests, in gardens, and in waste places.